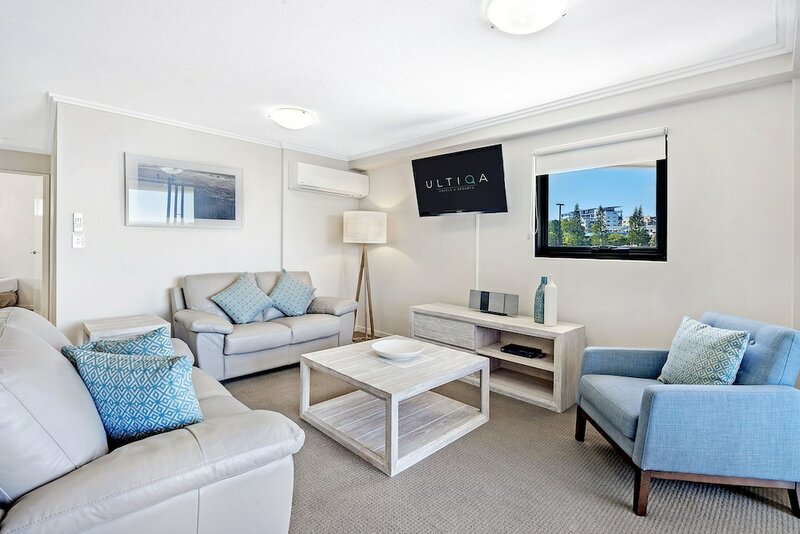 When you stay at ULTIQA Shearwater Resort in Kings Beach, you'll be on the beach, just steps from Kings Beach and 10 minutes by foot from Bulcock Beach. This 4.5-star apartment is 0.7 mi (1.2 km) from Shelly Beach and 7.8 mi (12.5 km) from Kawana Beach. Make yourself at home in one of the 62 air-conditioned rooms featuring refrigerators and LED televisions. Your pillowtop bed comes with premium bedding. Rooms have private balconies. Cable programming and DVD players are provided for your entertainment, while complimentary wireless Internet access keeps you connected. Private bathrooms with showers feature complimentary toiletries and hair dryers. Be sure to enjoy recreational amenities, including an outdoor pool, a spa tub, and a sauna. Additional amenities at this apartment include complimentary wireless Internet access, concierge services, and an arcade/game room. Grab a bite to eat at one of the apartment's 2 restaurants, or stay in and take advantage of the room service (during limited hours). Snacks are also available at the 2 coffee shops/cafés. Wrap up your day with a drink at the bar/lounge. Cooked-to-order breakfasts are available daily from 7:30 AM to 10:00 AM for a fee. Featured amenities include dry cleaning/laundry services, luggage storage, and laundry facilities. Event facilities at this apartment consist of a conference center and a meeting room. A roundtrip airport shuttle is provided for a surcharge (available 24 hours), and free self parking is available onsite. In addition to an outdoor pool and a children's pool, ULTIQA Shearwater Resort provides a spa tub and a sauna. Dining is available at one of the apartment's 2 restaurants and guests can grab coffee at one of the 2 coffee shops/cafés. A bar/lounge is on site where guests can unwind with a drink. Wireless Internet access is complimentary. This luxury apartment also offers a fitness center, a library, and tour/ticket assistance. For a surcharge, a roundtrip airport shuttle (available 24 hours) is offered to guests. Onsite self parking is complimentary. ULTIQA Shearwater Resort is a smoke-free property. Cooked-to-order breakfasts are available for a surcharge and are served each morning between 7:30 AM and 10:00 AM. ULTIQA Shearwater Resort has 2 restaurants on site. An outdoor pool, a children's pool, and a spa tub are on site. Other recreational amenities include a sauna and a fitness center. This property's front desk hours are 9 AM-5 PM Monday-Friday and 9 AM-1 PM Saturday, Sunday, and public holidays. For more details on check-in times, please contact the property using the information on the reservation confirmation received after booking. For after-hours check-in, dial #222 on the console located outside reception. Rollaway/extra beds are available for AUD 30.00 per night. Cribs (infant beds) are available for AUD 20 per night. This property offers transfers from the airport (surcharges may apply). Guests must contact the property with arrival details before travel, using the contact information on the booking confirmation. Only registered guests are allowed in the guestrooms.